Home / What is a surface water drainage system? 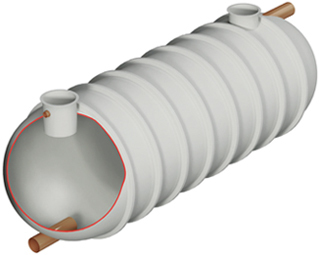 What is a surface water drainage system? There are two sources of water which a domestic drainage system needs to handle: foul water and surface water. As mentioned in a previous article, the foul water drainage system handles all the wastewater emitted from appliances in your home – from toilets and showers to washing machines. In this blog post, we’ll be taking a look at the second source – surface water – and the water drainage system which manages this. Surface water is rainwater and melted snow which lands on your roof or other impermeable surfaces around your property – such as driveways – and needs to drain away. Surface water drainage systems are the means by which such water is carried away and dealt with. All properties will have a form of surface water drainage in place to ensure that they aren’t affected by water damage. These systems will help to prevent standing water and flooding at your property, both of which can cause serious damage. These well-established systems aren’t necessarily complex but can make the difference between a warm, dry house and water ingress. For surface water at your roof, the sloped surfaces of your tiles which direct water flow to your guttering is what keeps rainwater from pooling. The guttering system should be tailored to your property, ensuring it can handle large enough volumes of water according to the size of roof which it serves. The gutters will connect to downpipes which carry the water to ground level, usually emptying out into a storm/surface water drain. It is often to these drains that water runoff from driveways directs as well. Once surface water enters a drain, it will either flow through a combined sewer which handles both foul water and surface water together, or through a surface water sewer. Which kind of sewer depends on the infrastructure present in your area. Once it’s in this sewer system, your water company will handle and process it. If you do not connect to the public sewer as part of your surface water drainage system, you might be entitled to a surface water drainage rebate. Instead of relying on and paying the water company for handling rainwater, you might have a soakaway, or similar, installed at your property. A soakaway is an underground system which will store rainwater from your premises and slowly release it back into the ground. Water companies won’t necessarily be aware of the infrastructure at your individual property so it is up to you to apply for a rebate. You will need to fill out an application form from your individual water company – there are several which serve different areas of the UK – proving that surface water at your property doesn’t enter the public sewers. If you can successfully prove this, you will no longer be charged for the service and you will see reduction in the amount you pay on your water bills. You should have been told whether your house includes a soakaway when you bought the property. However, if you are unsure, you should consult the title deeds or get in touch with your local council to obtain a copy of the original planning application for your property to see what’s included at your premises. Wildon UK is a drainage and wastewater specialist, operating out of Staffordshire and serving customers throughout the UK. We have a team of highly-trained, skilled engineers who can carry out work on a wide variety of wastewater and drainage systems, including installations, maintenance and repairs. For more information about our products or services, don’t hesitate to contact our helpful team today.